The Indian soan papdi market is projected to grow at a CAGR (compounded annual growth rate) of around 12 per cent until 2023. This was the among the findings of research-based global management consulting firm TechSci Research’s report, titled Indian Soan Papdi Market By Segment, By Type, By Distribution Channel, By State, Competition Forecast and Opportunities, 2023. This growth is on account of the expanding distribution network, increasing number of modern retail chains and aggressive marketing strategies by major soan papdi manufacturers. Moreover, the emergence of different flavours of soan papdi, along with its longer shelf life and easy availability, is further fuelling the demand for soan papdi across India. Millennial and Z generation accounts for a major share in India’s population. The majority of individuals are health-conscious and keep a check on what they are consuming. Packaged sweets are considered more hygienic as compared to traditional Indian sweets, as the manufacturers of packaged sweets have to follow the norms and regulations laid down by FSSAI. Additionally, the introduction of sugar-free soan papdi is further pushing the demand for this sweet among millennials. On the basis of type, the Indian soan papdi food market is segmented into classic and flavor. Although classic is the dominant type, the demand for flavoured soan papdi is expected to increase at a significant pace through 2023, on account of the changing preference of consumers from traditional soan papdi to different flavours like orange, chocolate, pista soan papdi, badam soan papdi, etc. Among regions, North India is the major demand generator of soan papdi, owing to the increasing per capita disposable income due to the larger working population, the rising inclination towards traditional sweets and the increasing variety of flavours. “Soan papdi comes pre-packaged in plastic packs which are easier to carry and have a relatively longer shelf life. Thus, it emerges as a popular product for gifting during festivals,” said Karan Chechi, research director, TechSci Research. “Further, to promote soan papdi, manufacturers are investing in marketing strategies and introducing new products in innovative packaging, customised flavours and sugar-free variants. Such developments would steer growth in India soan papdi market during forecast period,” he added. 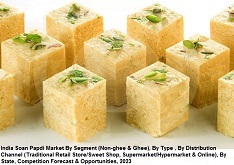 The report evaluated the future growth potential of India soan papdi market and provided statistics and information on the market structure, size, share and future growth. It was intended to provide cutting-edge market intelligence and help decision-makers to take sound investment decision. Besides, the report also identified and analysed the emerging trends along with essential drivers, challenges and opportunities present in the Indian soan papdi market.